Meet my best buddy, Mr. Mouth. Creepy? Yes. Useful? Couldn’t possibly live without him. You can probably tell that this mouth is well loved. I didn’t quite realize how ragged he looked until I took a picture of him to send to a friend. What makes this mouth invaluable to me is that I can manipulate his tongue to show students placement of the tongue for various sounds. The problem with videos and diagrams of sounds that you can find online is that they can’t effectively show the placement and movement of the tongue. Drawings can’t even remotely capture the complexity of speech production. Videos often show a speaker pronouncing the sound, but much of the tongue is hidden by the teeth and lips. To really learn how to produce a sound accurately, you need specific direction about how to place and move the tongue and lips. You also need to learn to hear how the target differs from your current production. (I will insert a plug here for the Rupp Method℠which addresses all of this and more). 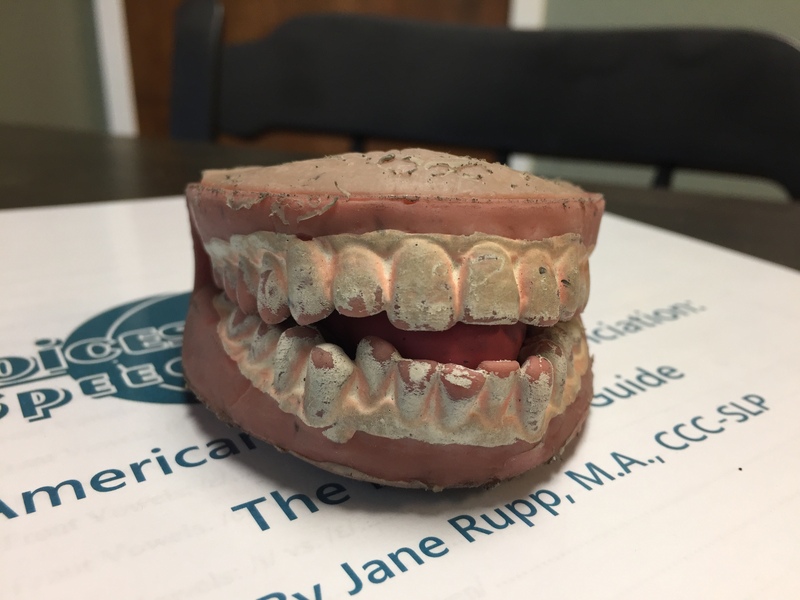 Unfortunately, when I ordered a back-up mouth, I was extremely disappointed to find that the “new and improved” mouth is inflexible with a ridiculously short, flat, and unusable tongue. An extensive web search led me to find my beloved mouth… He is no longer a speech therapy tool, but a gag gift with disgusting, floppy eyes. Despite his new and horrific look, I found myself ordering a lifetime supply of mouths in fear that he might someday no longer be available at all. Come see what the magic is all about. Get in touch to set up a free consultation with me and Mr. Mouth. We’ll be happy to chat with you about all of your communication needs.